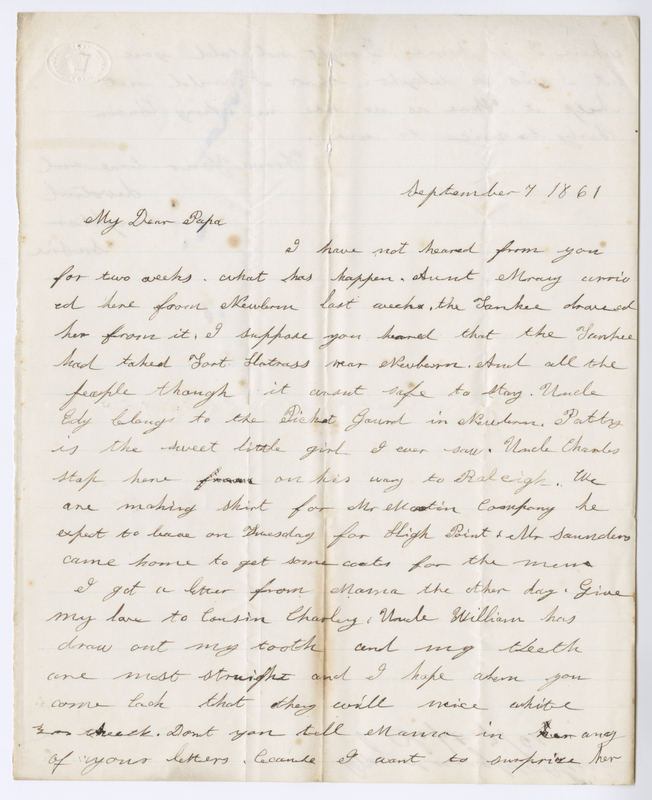 Item description: Twelve-year-old Susie Mallett writes this letter to her relatives in Chapel Hill while her father, Peter Mallett, served in the 3rd North Carolina Infantry. 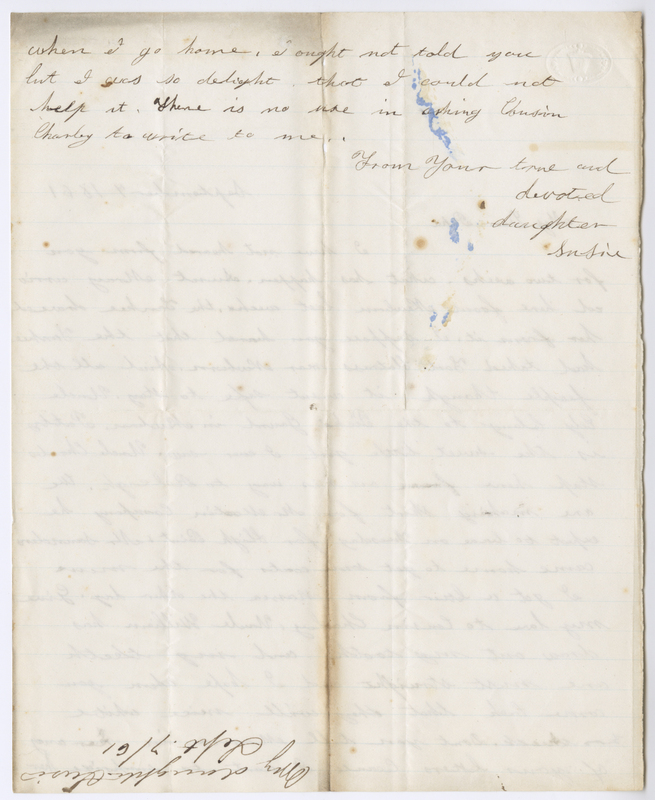 In the letter, Susie notes the arrival of her aunt Mary Mallett from New Bern after the capture of Hatteras Inlet by Union forces on August 29, 1861. Fearing for their safety, many of the residents of eastern North Carolina fled to the central and western regions of the state, including Chapel Hill. Item citation: From folder 5 in the Peter Mallett Papers #480, Southern Historical Collection, The Wilson Library, University of North Carolina at Chapel Hill. I have not heard from you for two weeks. What has happen. Aunt Mary arrived here from Newbern last week. The Yankee droved her from it. I suppose you heard that the Yankee had taked Fort Hatrass near Newbern. And all the people though it wasn’t safe to stay. Uncle Edy belongs to the Picket Gaurd in Newbern. Patty is the sweet little girl I ever saw. Uncle Charles stops here on his way to Raleigh. We are making shirt for Mr. Martin company. He expect to leave on Tuesday for High Point. Mr. Saunders came home to get some coats for the men. I got a letter from Mama the other day. Give my love to Cousin Charley. Uncle William has draw out my tooth and my teeth are most straight and I hope when you come back that they will nice white teeth. Don’t you tell Mama in any of your letters because I want to surprise her when I go home. I ought not told you but I was so delight that I could not help it. There is no use in asking Cousin Charley to write to me. This entry was posted in Southern Historical Collection and tagged Chapel Hill, New Bern, Peter Mallett, refugees, Susie Mallett. Bookmark the permalink.